There are many similarities between mathematics and music. They are their own vocabulary, their own written language, their own way of describing the world around us, but while they are similar the Venn diagram that contains mathematics and music doesn’t always seem to have a huge overlap. 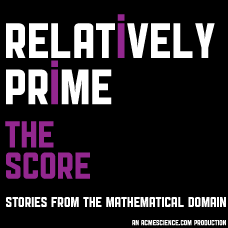 This episode of Relatively Prime brings you three stories from that intersection. First a story of mathematics applied to music, in a way that no musician would have thought up. Next a story of what happen when you take mathematician and musician and combine it into a single person. Finally, the story of a composer and how he has harnessed the power of numbers as a music creation tool. Scott Rickard is the director of the Complex & Adaptive Systems Laboratory, and a Professor of Electrical Engineering, at the University College Dublin. His work on mathematics and music was initially presented at TEDxMIA, the video of which spread like wildfire. Robert Schneider is the lead singer of the band The Apples in Stereo and a cofounder of The Elephant Six Recording Collective. Oh, and he is currently studying for a Ph.D. of mathematics at Emory University. Robert Schneider is currently studying for a Ph.D. of mathematics at Emory University. Oh, and he is the lead singer of the band The Apples in Stereo and a cofounder of The Elephant Six Recording Collective. Here is a video of the song, CPU, played during the story. Jonathan Middleton is a composer, and Professor of Composition at Eastern Washington University. His website, Musical Algorithms, provides a way to turn numbers, sequences, DNA, and many other things into compositions.